This is the final entry in the Herschel Test Campaign journal series, which ran from August 2005 to February 2009. The journal covered the main activities during Herschel's extensive spacecraft and instrument test campaigns. It was followed by the Herschel Launch Campaign journal series, which ran from February 2009 until just before launch in May 2009 (see link in right-hand menu). 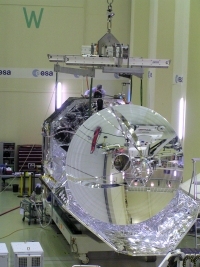 Following the completion of the environmental test campaign at the end of 2008 the Herschel spacecraft has undergone a number of routine functional tests. These were completed last week and the spacecraft is now being prepared for transport to the launch site at Kourou. On Tuesday 27 January, the spacecraft was tilted into a horizontal position on the Multi Purpose Trolley (MPT) in preparation for opto-mechanical verification of the telescope. The verification consists of distance measurements between the primary (M1) and secondary (M2) mirrors and is performed after any significant testing, transport and handling activities of the telescope - in this case after the environmental tests that were concluded in December. The measurements were completed the same day and were made using a high precision laser tracker device to determine the distance between M1 and M2. The telescope was then placed in an upright position, still on the MPT, and the final functional tests were performed. On Thursday 29 January, the first activities for the forthcoming transport and shipment to Kourou were performed with the securing of Herschel onto the lower part of its transport container. After first attaching the spacecraft with 4 bands to the Herschel horizontal lifting device, which was hanging from an overhead crane, the spacecraft was detached from the MPT by removing the connecting bolts. 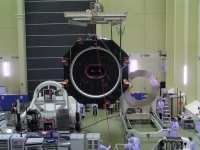 Left: With Herschel secured by an overhead crane the spacecraft is being unbolted from the MPT to be transferred to the container. 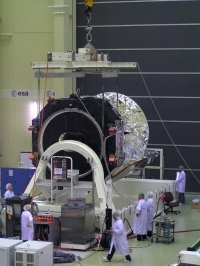 Right: Herschel is hoisted from the MPT and rotated by 180° to align it with the container (in the background, on the left). 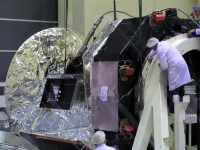 The spacecraft was then carefully moved away from the MPT and hoisted up inside the cleanroom. Standing nearby was the base of the Herschel transport container, equipped with a custom support stand to secure the spacecraft in a horizontal position. The 3-tonne spacecraft was slowly rotated by 180 degrees to align it with the transport container and was then carefully manoeuvred over the container using the overhead crane. Herschel was steadily lowered to align the spacecraft with the circular support stand of the container, to which it was finally securely bolted. The cover of the container will be put in place over the spacecraft later this week. Next week the container will be brought by road to Amsterdam Airport Schiphol from where it will be transported, by an Antonov cargo plane, to the launch site at Kourou. These activities will be reported in the Herschel Launch Campaign Journals on this web site.